Tom Paley | The Goose Is Out! Hooray! We’d wanted to get Tom to the Goose for ages, as we’re both fans, and finally we did! It was a great night! And now he’s coming to The Ivy House! Hooray again! 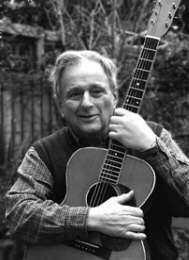 Born and raised in New York City, Tom Paley fell in love, long ago, with traditional folk-music. He began playing guitar and 5-string banjo and was soon well-known for his instrumental skill. For a time, he performed in a duo with Woody Guthrie. Later, with Mike Seeger and John Cohen, he formed The New Lost City Ramblers, the group that generated a great wave of interest in the traditional string band music of the rural South. After the breakup of the original NLCR, he formed the short-lived Old Reliable String Band (together with Roy Berkeley and Artie Rose) and then moved to Sweden, residing there for three years (1963-65) before moving to England, where he has lived ever since, touring often in America, the UK, Scandinavia and other parts of Europe, both solo and with other musicians. In England, he worked together, from about 1966, with Joe Locker and a series of fiddlers as the The New Deal String Band. The NDSB was temporarily laid on the shelf in the late 1970s but has been revived in recent years with Tom’s son, Ben, joining Tom and Joe as principal fiddler (though, in 1975, after many years on guitar and banjo, Tom took up fiddle as well, so the NDSB now has two fiddlers). At first, when Tom began playing fiddle, he played only the same sort of American Old-Time music that he’d been doing for years on guitar and banjo but, eventually, he began trying some of the strange and beautiful fiddle-tunes he heard in Sweden. Banjo and guitar are still his main instruments and American Old-Time music still makes up the bulk of his performance material, but Swedish fiddle-music now ranks equally high in his affections; he plays it whenever he gets a chance. In Sweden, he’s been awarded the coveted Zorn-medal (in bronze; not the highest award but not lightly given, especially to non-Swedes) for his Swedish fiddling. When he and Ben perform together, if it’s appropriate, they like to present the beautiful Swedish ‘twin-fiddle’ tradition, along with their hard-driving American music. Click here to find out more about Tom Paley! Listen to an interview with Tom Paley!